I read your attempt to decry evolution in your ring species article. Surely even you can’t deny that species such as the cave fishes of Tennessee or the albino Wetas of New Zealand caves are proven examples of life evolving? Non-New Zealanders may be wondering: what is a weta? A weta is a large insect found in New Zealand that looks similar to a grasshopper or cricket. (The plural of weta is weta, like sheep) Weta are normally brown, but an albino one is white, and its whiteness is not caused by the addition of any white substance, but through lack of pigment. Therefore, albino weta have lost their brown pigment. This is change, but is it evolution? One common cause of albinism is genetic mutation, where a gene needed for the development of pigment has been lost or damaged. The process of making melanin, the brown pigment found in the skin of many animals and of people, involves a number of biochemical processes, and the loss of the gene for any one of these results in no pigment being made. The loss of a gene is actually the opposite of evolution, and it certainly does not explain how genes for pigment came about in the first place. 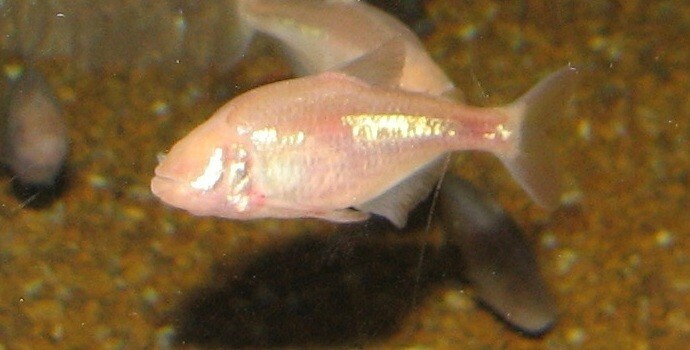 The other reason for lack of pigment is lack of light stimulation, and this is seen in some fishes which live in streams which flow into and through caves. The cave fish, Typhlichthys subterraneus, found in the southern states of the USA, normally lacks pigment in its skin, but some individuals have been shown to be able to develop pigment when exposed to white light. Unless they already possessed the genes to do so, they couldn’t make pigment even when they are given the right stimulus (in this case light) which turns the genes on. The loss of colour in this fish is also change, but it is definitely not evolution either. The other distinctive feature of cave fish most often referred to in High School textbooks as evidence of evolution, is that they are blind, and this is an evolutionary adaptation to not needing vision in a cave. These fish either don’t have eyes, or they only have remnants of eye structures, such as a lens, covered by a layer of skin. However this has now been shown to be due to ‘eye growth’ genes not being properly activated during the embryonic development of at least one species of cave fish named Astyanax mexicanus according to reports in Science, vol. 289 p631 28 July 2000, and Nature vol. 4431 p844 14 October 2004. This fish lives in the rivers of north eastern Mexico where those that live in rivers on the surface, where there is plenty of light, are pigmented and have fully functioning eyes. Other populations of the same species live in underground rivers that flow through lightless caves, and they are blind and non-pigmented. In an experiment to study the development of cave fish eyes, scientists removed the lens from the eye of the surface-dwelling fish and implanted it into the eye region of the blind fish. Within eight days an eye started to develop, and after two months the fish had a large functioning eye with a pupil, cornea, and iris. It seems a chemical signal from the lens was needed for the rest of the eye to develop, but the lens did not develop in the first place when the fish was born in a dark environment. Embryonic development of complex structures such as eyes involves a growth and development of different tissues in coordinated fashion, where the formation of one part of a structure sends signals for the next bit to start. If one part of the structure fails to develop the rest of the structure will not form or will degenerate. Further research has shown the activity of at least two genes, one named sonic hedgehog and another named pax6, differs in the cave fish compared to the above-ground fish. Eye development is a complicated process and the lack of eyes in blind cave fish is probably a mix of defective genes and lack of proper stimulation. Either way, no evolution is involved. The fish have changed from complex to simple, i.e. have undergone a degenerative process that is the opposite of evolution. The text book use of these fish as evidence for evolution is a good example of what we have often called “seeing the world through Darwin’s glasses”. It involves defining evolution as “change”, then accepting any change as proof of evolution, then claiming if change is true then evolution is true, and therefore creation didn’t happen. So if fish with eyes and pigment have changed by losing eyes and colour this is considered to be evolution, therefore sighted coloured fish could not have been created! This is widely believed, but it is still nonsense. In order to demonstrate evolution biologists need to show how a creature with no genes for pigment or eyes gains these genes, along with the appropriate regulating genes to turn them on and off at the right time during growth and development. No such change has been observed, let alone shown how it could happen. The eyes are blind cave fish are claimed to be evolutionary vestigial organs, but what are vestigial organs? Read the Creation Research article Vestigial Organs. Download PDF here. Find out what natural selection and other Darwinian processes really do in the DVD Darwin’s Evolution: a very unnatural selection Available from the Creation Research webshop.